Andalusia is fiesta country, and it is said that there is a festival happening somewhere in the region on almost every day of the year. These colourful and joyful events are a must see. There are many exciting fiestas and celebrations in Vejer de la Frontera and the surrounding area. See the calendar opposite or the page on Events in Vejer for more information. Beginning the weekend before Ash Wednesday, the Cadiz Carnival is a ten-day party consisting of processions, concerts, children's shows, puppets, fireworks and much more. It is the biggest annual carnival on mainland Spain. Semana Santa (Holy Week) in Seville sees the reenactment of the Passion, with up to 60,000 people taking part in sixty or so deeply moving processions throughout the week. As the statues of Christ and the Virgin are carried from their churches to the Cathedral to be blessed they are accompanied by nazarenos wearing pointed hoods and carrying long candles, penitentes bearing crosses, and bands playing haunting tunes. Some of the larger processions can take up to an hour to pass. The Feria de Abril (April Fair) which begins two weeks after Semana Santa, is held on the banks of the Guadalquivir river. The vast site, which is a sea of casetas (marquees) ablaze with colourful lights,resounds to the sound of joyful music and partying. Here you will taste exquisite food, drink the finest wines and enjoy some authentic flamenco. There are many other fiestas and celebrations throughout the year. Please ask for details. 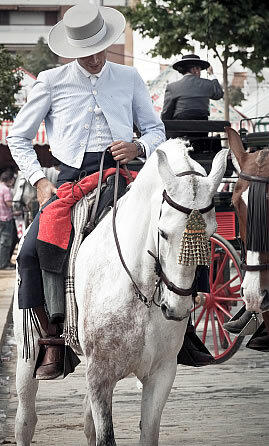 The Feria del Caballo (Horse Fair) in Jerez in early May is much more than the name suggests. Besides the major equestrian events there are many parties and celebrations late into the night. A chance to see Andalusia’s famous horses and riders at their very best.